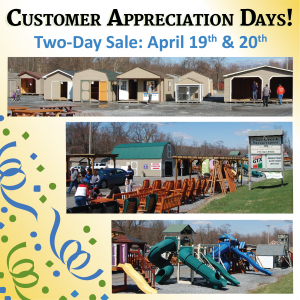 Visit Pine Creek Structures for a big dayof fun and savings! The event begins with a preview day Friday, where you can get a some great deals on Sheds, Garages, Play Sets,and Outdoor Patio Furniture! Enjoy free refreshments Saturday as you browse the lot and ask us all your storage questions! Buildings are always open! shop anytime. 10x12 Wooden Bedford Pergola 15 Months no Interest ! 8x10 Peak side Ebg-23028 15 Months No Interest !